If there’s an anti-consumerist message inherent in your artwork, maybe trying to sell that work at what is effectively a mall for art, where it costs money just to get in the door and have a look, is not the best way to go about things. It’s art fair week in Miami right now, which means a good chunk of the art world there partying and buying and selling and painting and hustling. I wish I was there, but I’m in Philadelphia working on my final exams. However, I’m still getting plenty of emails from people in Miami about what’s going on and what I might want to be covering on Vandalog. Two of those three similar pieces are in the photo at the top of this post. I don’t know where Gilf! stole those materials from, but I’m curious: Did she steal them from Walmart, or from some small warehouse in Brooklyn with unionized labor? It’s just $10-15 worth of materials, but if the act of the theft matters to Gilf!, then the victim matters to me, especially since the work is now for sale for presumably thousands of dollars through Arcilesi Homberg Fine Art (booth J25 at SCOPE). If Gilf! is going to make an artwork where the production of the work plays into its meaning, I think it’s fair to ask what role the sale of the work has on its meaning as well. Here Gilf! is hoping that the work will be sold at a venue that is all about “the monetary system of consumption” which she claims to be removing herself from. The most recent post-fair press release from SCOPE (for their Basel fair in June) is all about sales. On her own Instagram, Gilf! called Art Basel Miami Beach (the main art fair going on at the moment) “Black Friday for the 1%.” It’s naive to think SCOPE is any different, even if prices are lower. So, for me, seeing Gilf! 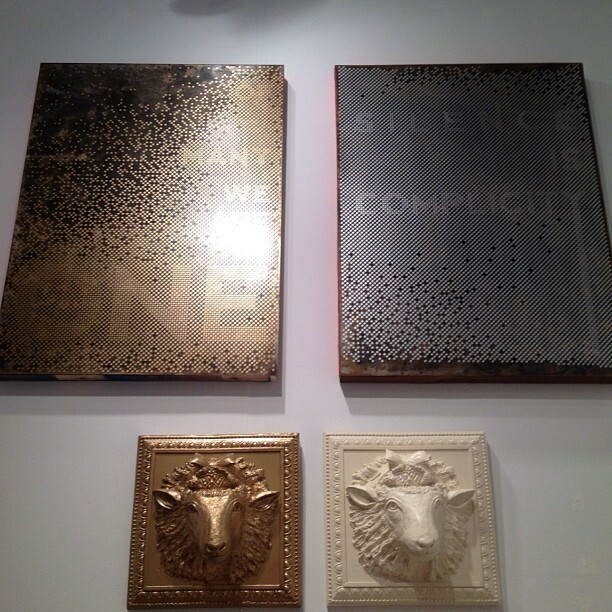 show these pieces at SCOPE pretty much negates any anti-consumerist message that the work may have. 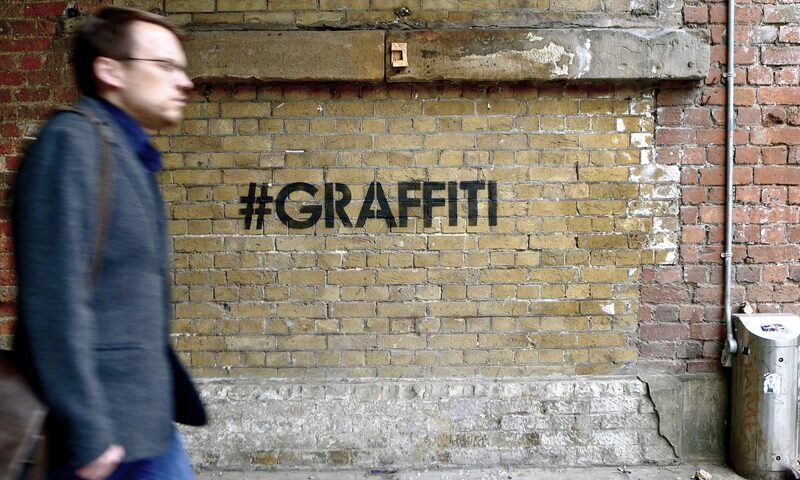 The situation reminds me of the scene in this classic screenprint by Banksy. Let’s compare this move by Gilf! to what Alec Monopoly has been up to this week. Last night, Alec held “a VIP-only exhibition located aboard a 151-foot yacht” in Miami. Sort of a hilarious setting for an artist whom I always assumed was at least pretending to use The Monopoly Man to critique out of control capitalism, the super-rich and the finance industry, but I recently realized that I’ve actually been looking at Alec’s work all wrong for years. When have you seen a street artist appropriate Mickey Mouse or Ronald McDonald or The Monopoly Man in order to say, “Let’s go watch a Disney movie, eat at McDonald’s and give high-fives to the folks at Goldman Sachs”? Usually, it seems like street artists using those symbols are more likely to be saying, “Let’s question our obsession with pop culture figures, remember that McDonald’s pays low wages and eating there too much might make you fat and reform our current economic system.” And Alec’s bio on his website states that he “subversively depict[s] various iconic pop culture characters.” A piece with a meaning like “Mickey Mouse is awesome” does not subvert Mickey Mouse, so I figured that his subversion of The Monopoly Man would be about subverting the capitalist system that the character represents. Makes sense, right? If you actually read interviews with Alec (like this one) or read press releases for his shows (like this one), it turns out that he isn’t making a critique at all. He’s actually celebrating capitalism by using The Monopoly Man character. He has said, “I feel that Mr. Monopoly, Rich “Uncle” Pennybags, represents capitalism, but my use of his image is more about reminding the general population that we are all a part of game that anyone of us can win.” Try telling that to someone without health insurance who’s just been diagnosed with cancer or a student graduating college with $100,000 in debt and no job prospects. So, I guess I was confused as a result of Alec not understanding what the word “subvert” means. Maybe I am the only one who thought Alec was pretending to critique capitalism. Just in case anyone else was under that impression too, I thought I’d bring it up. I’m still not a fan of Alec’s work and I find his take on the world to be somewhat naive, but at least he’s not being hypocritical. I’m not one to see things in black and white. I know people who are upset that Banksy sells his work at all, or that Shepard Fairey has a clothing line or who hate all art fairs, but I don’t have a problem with any of that. I think one of the great things about being an artist today is the potential to make a living and basically be your own boss. Yes, the artist is still participating in a consumerist/capitalist economy and their work may critique that world, but as Gilf! suggests, they can perhaps keep themselves at least a step removed from the worst parts of capitalism. But Banksy selling prints through Pictures on Walls or Shepard selling shirts with a message of “I’m not saying consumerism is good or bad, just that you shouldn’t follow blindly,” is quite a bit different from selling explicitly anti-consumerist art in the midst of an art mall and simultaneously claiming that you’re removing yourself from that system by your actions. That claim is just false. The question is whether or not Gilf! realizes it. So what should Gilf! do? I would like to say that there’s some way to salvage these artworks, but I’m not sure. Maybe selling them in a less money-centric environment would be a step in the right direction, but I dunno. At the very least, Gilf! needs to acknowledge that selling these artworks in the way she is trying to does not allow her “to step out of the monetary system of consumption” in any significant way. Stealing $10 worth of materials to sell a product in a mall for thousands of dollars? That sounds to me more like the worst parts of capitalism and consumerism than a removal from those systems.